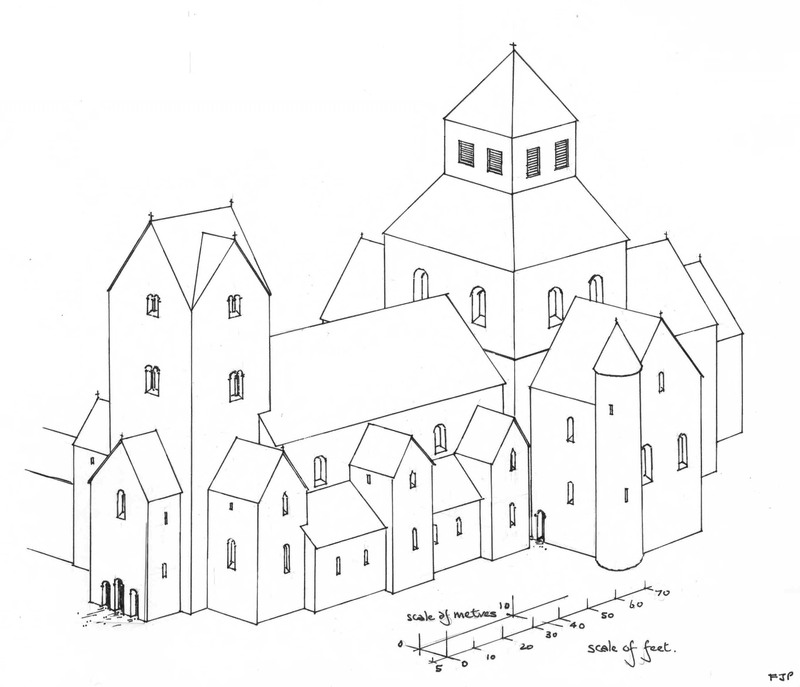 British and Anglo-Saxon architecture between the end of the Roman period and 1066, with particular reference to church fabric, both extant and from excavation. In celebration and recognition of the diverse skill of the church builders in Anglo-Saxon days, and remembering those who lived and worked and built the buildings we see today. Date of latest additions/updates 01/2019. Here are your links to all pages; the main link is the MENU/SITE MAP. See also the general index for full listings of subjects. Click for photos of Saxon church buildings (and other detail) with explanatory text. Various churches are also discussed including methods of building, the materials used (and re-used) and the changing styles of building through the period. Early and mid-Saxon work has many facets, and certainly the last 50 years or so before the conquest is almost a study in itself, and in that particularly difficult as the prime Saxon buildings in the kingdom, the Cathedrals and Minsters, Monasteries and greater churches have been much rebuilt, or perished with the 16th century Dissolution of the monasteries. Most visitors download the 400 plus Saxon church database covering all England, your comprehensive guide to the known Anglo-Saxon churches (based on H.Taylor's three volumes). More photo pages are being added to this site as time progresses. Searching for photographs of a particular church? Click on the small photo below left. Scroll down for more information. If you have logged on to this site before then refresh (F5) to see latest uploads. I have often thought how "scattered" information is on the net when trying to locate information on church buildings relating to the Saxon period, and how nice it would be if it could be found in one site. I don't pretend that you will find everything you wish to know here, but as I add to this site I hope that it may be useful and answer at least some of the questions you may have in mind. If you have visited this site previously then please refresh your browser to view any updates on pages. Click here for a full index of photo pages. This site has been loaded (autumn 2010) onto the Oxford University Woruldhord Project; since then there have been many new pages and additions and the content of this website has more than doubled. What a wonderful resource base you have created. I return to your website on a regular basis finding it an excellent resource. Thanks very much indeed for your incredibly detailed thoughts and analysis (about our church). They are absolutely fascinating. Paul. Reed, Herts. Thank you so much for creating the database - it has been so helpful for my research! Elanor. University of Sydney. Dear Frank, good to hear from you. I have used your website quite often and recommended it to students, it is a great resource, an impressive piece of work. Dr. Catherine M Hills. MA, PhD. Senior Fellow McDonald Institute for Archaeological Research. Fellow of Newnham College. Hi Frank, as always - this is brilliant. Mat, Preserve Our Past. I gladly acknowledge, and will frequently refer to, the indispensible and prime work "Anglo-Saxon Architecture", published in 3 volumes (1965 & 1978), by H.M.Taylor and Joan Taylor. I also draw your attention to Thomas Rickman, born at Maidenhead 8th June 1776 into a Quaker family, became an architect and through his careful study of churches and their periods of building he conceived labelling the main periods - Norman, Early English, Decorated and Perpendicular. It was Rickman who first recognised the Anglo-Saxon work in the tower at St.Peters, Barton-upon-Humber, and importantly deduced why it must be Saxon. Also Professor Banister Fletcher, the author of that sterling 19th century work "A History of Architecture on the Comparative Method". More recent contributors to Anglo-Saxon architectural studies are Professor Warwick Rodwell, and Eric Fernie. New pages will be under construction from time to time. A newer page (and which will be expanded) touches upon the re-use of Roman stonework. A few more suggestions here you may find useful; click to view towers, also (new) towers 2. Click for windows & belfry openings and roods & sculpture. There is a page upon the subject of sundials. Some photo/info pages added since 2014 include the church of St. Martin Canterbury, and which is possibly (partially) of Roman date. Other churces of early date are St. Marys, Reculver, and St. Peter-on-the-Wall at Bradwell-on-Sea. Also of very ancient date, remains of an early 'basilica' church at Lydd in Kent.The standing cross at Bewcastle is of particular interest. The photo page on Stow-in-Lindsey Saxon Minster has been expanded. A specific page (updated) explores the arguments for the Anglo-Saxon Abbey Church of Sherborne. There is a page upon the interesting and distinctive chapel of St. Laurence, Bradford upon Avon, Wiltshire. 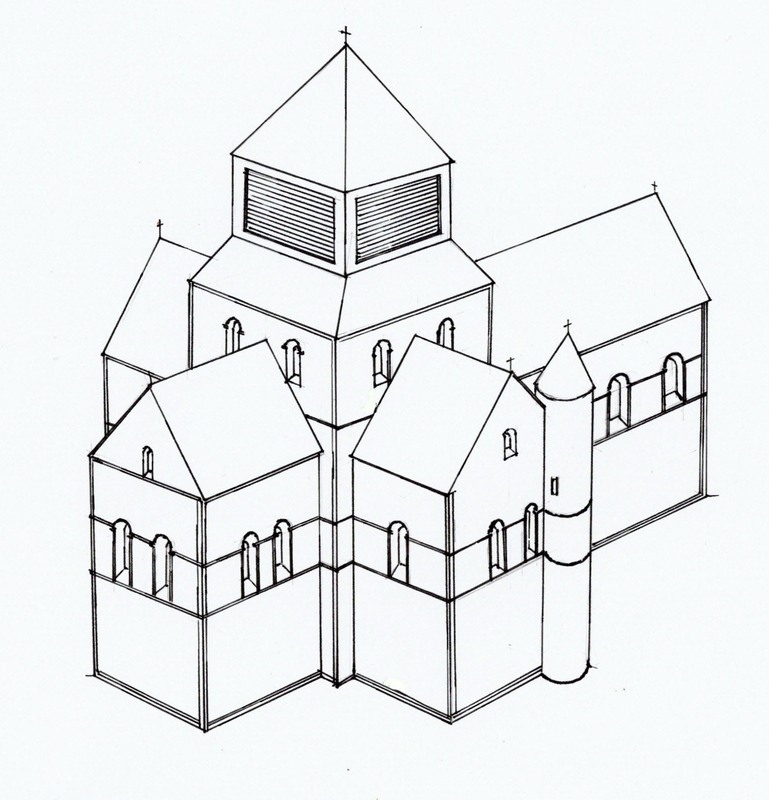 A visual reconstruction of the church at Trowbridge, Wilts (in conjunction with "Preserve Our Past" and Trowbridge Museum) from information gleaned during excavations of the castle site. Revised/expanded with new photographs and drawings is Netheravon church in Wiltshire. Also in Wilts, posted in 2019 is Britford chuch revised with new photogaphs and expanded text. Of especial interest is the Anglo-Saxon font in Wells cathedral, a rare and important survivor. A file/page upon the Anglo-Saxon tower of St.George in Oxford castle is of particular interest as along with Rougemont Gate at Exeter Castle it is a rare survivor of Anglo-Saxon work in a castle. Over 400 Saxon churches listed - an invaluable listing/database (additions/updates 12/2015), a downloadable table, unique to this site, giving information of the known Anglo-Saxon churches in England exhibiting Saxon features and fabric and with details of those features, a comprehensive listing noted by place name, county, and grid reference; wholly based on H.Taylor's three sterling volumes, "Anglo-Saxon Architecture". It should be noted that this reflects the information given in Taylors work completed in 1978; newer discoveries from other sources are being added as time progresses. 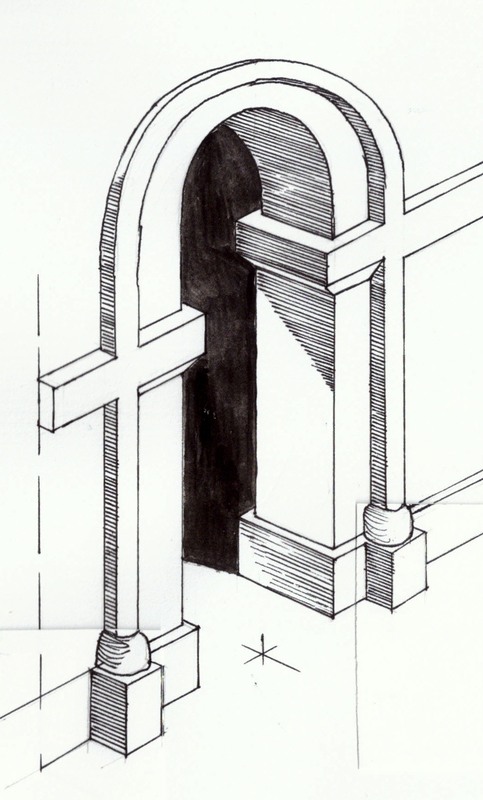 The ink drawing right: surviving Anglo-Saxon archway in Sherborne Abbey, shown here as it probably looked when built. Do please bookmark this page and return at regular intervals to watch progress. I intend this site to be a useful source of reference to the subject and where elements of known Anglo-Saxon work found in churches, minsters and the major cathedrals & Abbeys in England may be easily accessed via database tables. I hope you will find this web site useful and if you have a specific query and can't find the answer then simply email me and I'll get back to you. Click here for MENU page. Other information & news (most of these links will exit this site). Newly discovered (2016) Anglo-Saxon village at Little Carlton, near Louth, Lincs. The site in Lincolnshire is thought to have been a previously unknown monastic or trading centre. I quote - "Anglo-Saxon 'island' settlement discovered. Liason officer Adam Daubney and metal detectorist Graham Vickers have discovered a 'significant' archaeological site [Credit: University of Sheffield]" Click here to read more. Click here to read about Anglo-Saxon foundations discovered below the present Canterbury cathedral. Go to BBC News to read about the largest hoard of Anglo-Saxon gold discovered beneath a field in Staffordshire (in 2009). In the region of 1,500 gold and silver pieces, possibly dating to the 7th century. An update (12/2012); 90 more gold and silver artifacts found which belong to the finds previously unearthed. http://www.bbc.co.uk/news/uk-20771067 (paste this link into your browser). Go to BBC York & North Yorkshire to read about the recent discovery of a Saxon church, at Scrayingham, near Stamford Bridge, York; see page 9 of windows file (for photos). Go to Anglo-Saxon graves and tree-trunk coffins unearthed in Norfolk to read about an Anglo-Saxon cemetery unearthed with important remains, November 2016. Photos and images this page, from top. Ink drawing - Wimborne Minster church, Dorset; as it may have looked circa 1020 (with its extant staircase turret). Small inset photograph - window in nave/tower, Deerhurst church, Glos. Ink drawing of Anglo-Saxon archway in Sherborne Abbey (shown in orignal condition); refer to the pages on Sherborne Abbey for more detail. Ink drawing - Sherborne Abbey as it may have appeared in the early 11th century. Photo (inset below) of south arcade Great Paxton church, Huntingdonshire. Background photograph: Iconic Anglo-Saxon tower, Earls Barton church.